In an attempt to characterize the contribution of the 5-HT1B receptor to behavior, 5-HT1B knock-out (KO) mice were subjected to a battery of behavioral paradigms aimed at differentiating various components of cognitive and emotional behaviors. In an object exploration task, wild-type (WT) and 5-HT1B KO mice did not differ in locomotor activity. 5-HT1B KO mice, however, displayed lower thigmotaxis (an index of anxiety) associated with a higher level of object exploratory activity, but no genotype differences were observed in the elevated plus maze. 5-HT1B KO mice also displayed a lack of exploratory habituation. In the spatial version of the Morris water maze, 5-HT1B KO mice showed higher performances in acquisition and transfer test, which was not observed in the visual version of the task. No genotype differences were found in contextual fear conditioning, because both WT and 5-HT1B KO mice were able to remember the context where they had received the aversive stimulus. The deletion of the 5-HT1B receptor, associated with appropriate behavioral paradigms, thus allowed us to dissociate anxiety from response to novelty, and perseverative behavior (lack of habituation) from adaptive behavioral inhibition underlying cognitive flexibility (transfer stage in the water maze). The deletion of the 5-HT1B receptor did not result in significant developmental plasticities for other major 5-HT receptor types but may have influenced other neurotransmission systems. The 5-HT1B receptor may be a key target for serotonin in the modulation of cognitive behavior, particularly in situations involving a high cognitive demand. The multiplicity of serotonin [5-hydroxytryptamine (5-HT)] receptors, their linkage to different second messengers, and their neuronal distribution (Hoyer and Martin, 1996) have to be taken into account in the analysis of cognitive functions potentially modulated by 5-HT (Buhot, 1997). Serotonin receptors occupy strategic cellular and subcellular locations in the hippocampus, a key cerebral structure involved in spatial learning and memory (O’Keefe and Nadel, 1978; Buhot et al., 1991; Jaffard and Meunier, 1993; Jarrard, 1993) that receives a main influence from the septal cholinergic system (Brito et al., 1983; Kelsey and Vargas, 1993). Among the different 5-HT receptors, the 5-HT1B receptor is predominantly located on axon terminals where it generally inhibits neurotransmitter release (Boschert et al., 1994). These receptors, located on terminals of retinal ganglion cells in the superior colliculus (Boulenguez et al., 1996), control visual attentional processes (Boulenguez et al., 1995). The presence of 5-HT1B receptors in the hippocampal formation suggests a potential role for these receptors in modulating memory processes. Serotonin controls acetylcholine release through 5-HT1B receptors located on septal terminals in the hippocampus (Maura and Raiteri, 1986) and glutamate release in the dorsal subiculum through 5-HT1B receptors located on CA1 pyramidal neuron terminals (Aı̈t Amara et al., 1995; Boeijinga and Boddeke, 1996). Rats receiving a stimulation of hippocampal (CA1) 5-HT1B receptors were found to be impaired in a spatial learning task, displaying more reference than working memory errors (Buhot et al., 1995), and exhibited neophobic reactions in an object exploration task (Buhot and Naı̈li, 1995). These results suggest that the inactivation of 5-HT1B receptors might affect attention and emotion and have positive effects on learning and memory processes. The lack of specific 5-HT1B antagonists led us to adopt a molecular biological strategy for studying the implication of 5-HT1B receptor in cognitive functions, especially in the cognition/emotion balance, by using 5-HT1B receptor knock-out (5-HT1B KO) mice (Saudou et al., 1994) as subjects using different hippocampal-dependent and -independent tasks. We used behavioral paradigms that are mainly targeted toward the analysis of spatial behavior and spatial memory and otherwise do not require food deprivation [the 5-HT1B receptor being involved in food intake (Lee and Simanski, 1997)]. The object exploration paradigm induces responses to novelty, involving cognitive (active exploration and habituation) as well as emotional reactions, that are mainly controlled by the hippocampus (Save et al., 1992a,b; Buhot and Naı̈li, 1995). Hippocampal-mediated memory performances were further assessed using the Morris water maze (Morris, 1984). We assessed spatial reference and working memory and visual orientation using appropriate versions of the task. To evaluate whether the lack of 5-HT1B receptor affects simple or complex associative learning, we also tested the mice in cued (hippocampal-independent) and contextual (hippocampal-dependent) fear conditioning (Garcia et al., 1997). The constitutive 5-HT1B KO mice may exhibit a degree of neuronal plasticity attributable to the absence of the receptor during development, which may be responsible for the observed behavioral changes. It is thus clear that our model cannot definitely decide whether the 5-HT1B receptor is directly or indirectly involved in memory processes. The “chronic” deletion of the 5-HT1B receptor may also affect indirectly cognitive functions through a modification of emotional state, locomotor activity, or some form of impulsiveness of the animal. These different behavioral components were separately analyzed further using the elevated plus maze, activity boxes, and spontaneous alternation, respectively. To assess possible developmental plasticities of 5-HT receptors in anatomical structures related to the behaviors under study, the density of 5-HT1A, 5HT1B, and 5-HT1D binding sites was determined by quantitative autoradiography. The subjects were male 129-Sv-ter wild-type (WT) and homozygous 5-HT1B KO mice. On receipt from the breeding colony (Transgenose Laboratory, Bordeaux II University), they were housed individually in standard transparent laboratory cages (26 × 12 × 14 cm) in a temperature-controlled colony room (22 ± 1°C), adjacent to the experimental room. They were maintained on a 12 hr artificial light/dark cycle (with lights on at 6:00 A.M.) and provided with food and water ad libitum. The experiments started when the animals were ∼5 months old, weighing 25–35 gm. They were tested during the light phase between 10:00 A.M. and 5:00 P.M.
General materials and methods. The subjects of this study were 18 naive male WT and 15 naive male 5-HT1B KO mice. The apparatus consisted of a circular open field, 70 cm in diameter with 30 cm high walls, made of white cardboard [for details, see Buhot and Naı̈li (1995)]. The mice were handled daily for 10 min during a week before they were subjected to two exploration tests, separated by a month. Within each experiment, WT and 5-HT1B KO mice were tested alternately to avoid any circadian effect on the activity of the animals. The open field was cleaned only at the end of the experiment for a given animal. Animal movements (distance and duration) were recorded using the “VIDEOTRACK” system (Viewpoint, Lyon, France) as previously used for rats (Buhot and Naı̈li, 1995). Locomotor activity was assessed by fast movements (displacements equal to or faster than 10 cm/sec) in the entire open field. Object-oriented exploration was assessed by slow movements (slower than 10 cm/sec) within object(s) area(s). Thigmotaxic behavior, i.e., avoiding open areas, here the center of the field, was assessed by the relative time spent at periphery, that is, in a crown-shaped region (5 cm in width) close to the limit of the cylinder. The effect of genotype (WT vs 5-HT1B KO) on locomotor activity, thigmotaxic behavior, and object-oriented exploration was evaluated by using one-way ANOVAs (Statview 4.5, SuperANOVA, Abacus Concept), whenever more complex analyses (if not otherwise precise) were not necessary. When analyses across sessions were required, the data were introduced into two-way ANOVAs for repeated measures. Further F tests for particular within-group comparisons were conducted when the main effects were significant. Other pair-comparisons were performed by a post hoc (Scheffe) test, when necessary. Single-session task. Each mouse was placed for 5 min in the open field containing a single object, a brilliant sphere (Christmas ball) 5 cm in diameter, located in the middle of the arena. Multiple-session task. Two conspicuous patterns were attached to the wall of the open field: a circular white pattern (18 cm in diameter) with black dots and a squared white pattern (18 cm × 18 cm) with black vertical strips. Four different objects were used that differed mainly by shape: (1) a small shampoo bottle (3.5 cm in diameter, 6.5 cm in height), (2) a water jug (4 cm in diameter, 7 cm in height), (3) a thin cylinder (3.5 cm in diameter, 7 cm in height), or (4) a wide cylinder (5 cm in diameter, 5 cm in height). Each mouse received seven 6 min exploratory sessions, separated by 3 min intersession intervals, during which they were placed in their cages. The sequence of the successive sessions (and related observed behavior) followed the procedure for rats used by Buhot and Naı̈li (1995). Locomotor activity, thigmotaxic behavior, and object-oriented exploration across sessions were submitted to ANOVAs for statistical evaluation with genotype as between-subject and successive sessions as within-subject factors. Object exploratory activity was first assessed during session 2 on the basis of average mean exploratory activity toward the objects [(A+B+C)/3], compared with the same measure in the area containing no object. Exploratory habituation was assessed by comparing the average mean exploratory activity toward the objects [(A+B+C)/3] during sessions 2, 3, and 4. A decrease in exploratory activity between sessions 2 and 4 is taken as an index of habituation. The reaction to spatial change was assessed by comparing the mean exploratory activity toward the displaced object (C) and the nondisplaced objects [(A+B)/2] during sessions 4 and 5 (test session that included the spatial change). The reaction to the new object was assessed by comparing the exploratory activity toward object A during session 6 (the preceding habituation session) and toward object D during session 7 (when the new object D replaced object A in the same area). The nonspecific reaction was assessed by comparing the exploratory activity between sessions 6 and 7 toward the familiar object B, i.e., the one that never changed. Statistical analyses were conducted on the data using ANOVAs with the genotype as the between-subject factor, and session, “area” (object vs no object) or the category of “object” (displaced and nondisplaced, new and familiar) as within-subject factors. General materials and methods. The apparatus was a white circular swimming pool (140 cm in diameter) with walls 40 cm high. It was located in a room with various distal cues. The pool was filled with water (30 cm depth) maintained at 20°C, which was made opaque by the addition of a nontoxic white paint. Inside the pool was a removable, circular (13 cm in diameter) Plexiglas platform positioned such that its top surface was 0.5 cm below the surface of the water. The platform, which served as the refuge from the water, is generally located in the center of an arbitrarily defined quadrant of the maze. Data were collected using a video camera fixed to the ceiling of the room and connected to the VIDEOTRACK system and to a video recorder, both located in an adjacent room that received the individual home cages of mice currently tested. On the first day, each mouse received a first pretraining session that consisted of placing the mouse on the platform where it had to stay at least 15 sec, followed by a 30 sec swimming period, and ended by several trials of climbing onto the platform until each subject was able to climb without help. This nonspatial procedure was required to avoid confusion between procedural aspects of the task and subsequent spatial performance (Beiko et al., 1997). During the learning stages proper, each animal was subjected to a daily four-trial session. Before the first trial of the first session (second day), the mouse was placed for 15 sec on the platform. Each trial consisted of releasing the mouse into the water facing the outer edge of the pool at one of the quadrants (except the quadrant where the platform was located) and letting the animal escape to the platform before 90 sec had elapsed. A trial terminated when the animal reached the platform, where it remained for 15 sec. Mice that failed to find the platform within this time limit were placed onto the platform by the experimenter and had to stay there for 15 sec before being removed and placed back in their home cage for a 15 min inter-trial interval. The cages were placed beneath a heat lamp to reduce core temperature loss. The releasing point differed at each trial (for example, east, west, south, and east if the platform was in the north quadrant), and different sequences of releasing points were used from day to day. The mice were run by squads of six, i.e., they had their first trial successively, then their second, until the fourth and last one; WT and 5-HT1B KO mice ran alternately. On the last day of different learning stages, the animals were generally given a probe trial, replacing the fourth trial of the session, which consisted of letting the mouse swim in the pool while the platform was removed for a fixed duration (60 sec). Animal movements were recorded using the VIDEOTRACK system as described previously (see Object exploration, Materials and Methods). The data from the computer were processed using Excel (Microsoft). This processing allowed us to calculate the escape latency (time required to find the platform, in seconds), the path length (distance covered by the mouse until it finds the platform, in centimeters), and the swimming speed (velocity, in centimeters/second). Genotype (WT vs 5-HT1B KO), trial, and day were the main factors of the ANOVAs (using StatView 4.5 or SuperANOVA, Abacus Concepts). Particular analyses were conducted, as for the probe trials, with the time spent (1) in the different quadrants (QUADRANT) or (2) in the exact platform zone (or equivalent virtual areas in the other quadrants: PLATFORM) (Perrot-Sinal et al., 1996). The number of entries onto PLATFORM, as compared with the other three equivalent zones, was taken as revealing the number of crossings above this limited zone. ANOVAs were performed on these data with the genotype and area (four zones of the same type: QUADRANT or PLATFORM) as the main factors. Water maze: Experiment I. The subjects of this experiment were 12 naive male WT and 12 naive male 5-HT1B KO mice. On the first day, after the procedural pretraining, each mouse performed a visually guided orientation session, i.e., a series of four trials for which the submerged platform had a visible white cylinder (4 cm in diameter, 7 cm in height) on the top. The animal was first placed during 15 sec on the platform (located in the center of the north quadrant) and then released from an arbitrary peripheral location, from which it had to return to the platform. For each of the additional three trials, the platform was displaced to a new location, and the animal was released from a new peripheral position. The experiment was performed with the hidden platform to evaluate spatial reference memory performances and was composed of three main steps: (1) acquisition stage (9 d), with the escape platform located in the center of the north quadrant; (2) transfer stage (4 d), with the platform located in the center of the east quadrant; and (3) long-term retrieval test, which was an additional session of four trials (the platform remained in the same east quadrant), performed 3 weeks after the end of the transfer stage. In this experiment, the only measure available was the escape latency to the platform. Water maze: Experiment II. Given the results of Experiment I, we decided to replicate the experiment and to record additional variables, allowing a more precise determination of the nature of performances, such as path length to reach the platform and velocity. 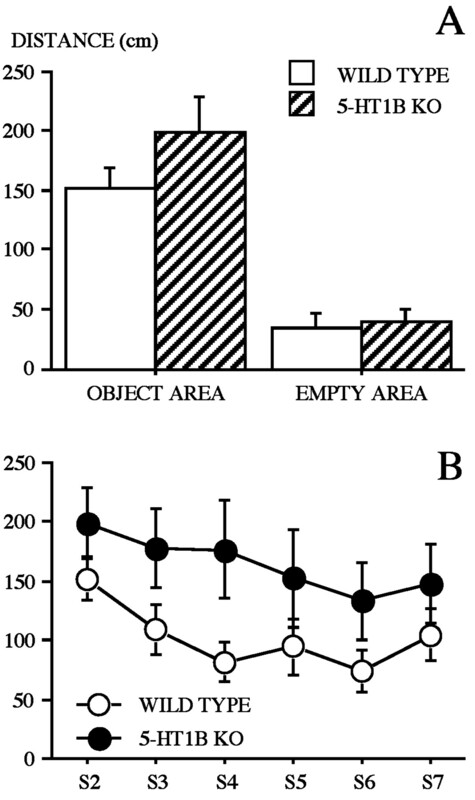 New groups of 12 WT and 12 5-HT1B KO mice were subjected to the experiment using the same spatial reference memory paradigm as for Experiment I except that (1) they did not perform the initial visually guided orientation task with the nonstationary platform, and (2) the experiment was followed by a 5 d working memory (repeated acquisition) task. Each day the platform was placed in a new location, and the mouse had to find it across four successive trials (10 min inter-trial interval). This paradigm involves extinction of the use of reference memory, and the mice had to solve a new spatial problem each day. The first daily trial was preceded by the exposure of the mouse to the platform location (for 15 sec on the platform). The releasing points were different within a session. The successive stages of this experiment were thus: acquisition stage (10 d, with a probe trial on the fourth trial of the last day); transfer stage (4 d, with a probe trial on the fourth trial of the last day); and working memory task (5 d). Two weeks after the completion of the water maze (Experiment II), the same mice performed the following tests, in the order described here, separated by a 1 week delay between each. The apparatus was a Y-maze made of clear opaque Plexiglas. It consisted of three identical arms (34 × 10 × 18 cm) converging at the center of a triangular area, so that they formed a symmetrical Y shape (120° of angular deviation from each other). The apparatus was placed on the floor of the experimental room, and a video camera hung above the apparatus recorded the behavior of the animals. WT and 5-HT1B KO mice were placed individually in the central area and allowed to explore the maze freely for 6 min. The sequence of arms visited was recorded. Global activity was assessed by the number of visits to the different arms. Simple alternation (vs repetition) was defined as a visit to one arm followed by a visit to another arm. Second order alternation was defined as the consecutive entry into all three arms on consecutive choices. In this case, the full alternation frequency was calculated as the ratio of (actual alternation/maximum alternations possible). The frequency of occurrence of full alternation on three arms was compared with the frequency of occurrence of incomplete or null alternation patterns. Because the second order alternation may reveal stereotyped behavior based on a preferred side (clockwise or counterclockwise exploration), an additional index of laterality was calculated. The data were statistically evaluated by ANOVAs, with the genotype as the between-subject factor, and alternation (vs repetition), left (vs right), and different patterns of second order alternation (three levels) as the within-subject factors. The elevated plus maze was used to assess anxiety in WT and 5-HT1B KO mice to determine possible interfering emotional factors that may modulate performance in learning and memory tasks (Chopin and Briley, 1987). The plus maze was made of four, dark gray Plexiglas arms, two open arms (67 × 7 cm), and two enclosed arms (67 × 7 × 17 cm) that formed a cross shape with the two open arms opposite each other. The maze was 55 cm above the floor and dimly illuminated (20 lux). Photobeam cells (connected to a computer), placed at two different levels along the length of each arm, allowed detection of the passage of the animal from the central platform (7 × 7 cm) to any arm, and from the middle of an arm to its extremity (and return). WT and 5-HT1B KO mice were placed individually on the central platform, facing an open arm, and allowed to explore the apparatus for 8 min. Global activity was assessed by the number of entries into the four arms. Anxiety was assessed by comparing the activity in the open versus enclosed arms, using an index taking into account the time spent in each category of arm as the ratio: open arms/(open + enclosed arms). The lower value is this index, the higher is the level of anxiety. The data were statistically evaluated using ANOVAs, with the genotype as the between factor and the arm (open and enclosed) as the within factor. We assessed contextual (hippocampal-mediated) memory using the conditioned fear paradigm with two groups of WT and 5-HT1B KO mice that had been subjected previously (1 month before) to the water maze task (Experiment II), using a procedure adapted from Bach et al. (1995)[see also Garcia et al. (1997)]. The test is composed of three 6 min sessions. On the training day, each mouse (either a WT or a 5-HT1B KO, in alternation) was brought to a novel room and placed for 6 min in the conditioning chamber, a mouse operant rectangular box (30 × 24 × 22 cm) with a floor made of 60 stainless steel rods (2 mm in diameter) spaced 5 mm and connected to a generator that delivered electric shocks. Two footshocks (0.9 mA, 2 msec) were delivered at 2 and 4 min after the mouse was placed in the chamber. Two tones (60 dB, 900 Hz, 20 sec) were paired with the onset of the shocks. Memory for either the context-shock or tone-shock association was assessed 24 hr after the training session during two successive 6 min test sessions by measuring the amount of freezing (freezing conditioned emotional response) exhibited by the mouse in the presence of the old context alone (without tone) and then (2 hr later) in the presence of the tone (60 dB, 900 Hz, 2 min, occurring at 2 min) in a novel context (white Plexiglas chamber, same dimensions as the first chamber, without grid floor). The apparatus was cleaned with water after each passage. The experiment took place in a dimly lit room (20 lux). The VIDEOTRACK system was used to measure the duration of freezing, i.e., time spent in total immobility (threshold of movements <1.5 cm/sec). ANOVAs were conducted on these data as previously described with the genotype, session (3 levels), and block of 2 min (three levels for a given session) as the main factors. Locomotor activity was assessed using cylindrical activity cages where the animal can move inside a cylindrical corridor (outer diameter, 20 cm; inner diameter, 10 cm). Eight photobeam cells connected to a computer allowed us to measure the activity defined as the number of revolutions per minute made by the mouse. A battery of six cages enabled six mice to be tested simultaneously. WT and 5-HT1B KO mice were placed individually in one of the cages at 10:00 A.M., and they were retrieved at 11:00 A.M. the same day. The time sampling chosen was a measure every 5 min. The 5-HT1A/1B receptor agonist 5-methoxy-3-(1,2,5,6-tetrahydropyrid-4-yl)-1H-indole (RU 24969, 5 mg/kg, i.p.) induces hyperlocomotion in rats and mice (Oberlander et al., 1987). 5-HT1B KO adult mice are not sensitive to this treatment (Saudou et al., 1994), which suggests that this drug affects locomotion via 5-HT1B receptors. Mice were placed individually in the activity cages (as described above) for a 60 min period; they then received an injection of RU 24969 (5 mg/kg, i.p., dissolved in saline) before being returned to the activity cage for two additional 60 min periods. The time sampling chosen was a measure every 30 min. Preparation of the brains, coronal frontal sections, incubation, and exposure were performed as described in Boulenguez et al. (1993). 5-HT1B/1D binding sites were labeled with 0.3 nmserotonin-O-carboxy-methyl-glycyl[125I]tyrosinamide (S-CM-G[125I]TN H2, 2000 Ci/mmol; Immunotech SA). 5-HT1B and 5-HT1D binding sites were specifically labeled by adding 10−5m8-hydroxy-2-(di-n-propylamino)tetralin (8-OH-DPAT; RBI, Natick, MA], and 10−6m3-(1,2,5,6-tetrahydropyrid-4-yl)pyrrolo[3,2-b]pyrid-5-one (CP 93129; Pfizer) (Macor et al., 1990), respectively, to the incubation medium. 5-HT1A binding sites were labeled with 1 nm[3H] 8-OH-DPAT (140 Ci/mmol, Amersham). Nonspecific binding was determined in the presence of 10−5m serotonin (Sigma, St. Louis, MO). Quantitative analysis of autoradiograms was performed with a computer device for image analysis (Biolab) (Segu et al., 1990). Four to 11 brains from each genotype were used. The mean density of labeling of each anatomical structure of interest (three sections/brain) was expressed in nanocuries/milligram of tissue equivalent according to reference standards (nCi/mg). The different anatomical structures analyzed were substantia nigra, striatum, and globus pallidus for 5-HT1B/1D binding sites; and oriens, radiatum, and lacunosum moleculare layers of CA1, granular, and molecular layers of dentate gyrus and outer and inner layers of parietal cortex for 5-HT1A binding sites. Locomotor activity displayed by WT and 5-HT1B KO mice is shown in Figure 1A by the mean distance run in fast movements. The statistical analysis performed on the data revealed no significant effect of genotype. In contrast, thigmotaxis differed according to the genotype (F(1,31) = 7.10; p < 0.02), with 5-HT1B KO mice spending less time at periphery (Fig.1B). 5-HT1B KO mice differed from WT mice (F(1,31) = 5.42; p < 0.05) by their higher exploratory activity toward the object (Fig.1C). Activity in the open field of wild-type and 5-HT1B KO mice in the single-session exploration test. A, Locomotor activity as measured by the mean (±SE) distance run (centimeters) in fast movements. B, Thigmotaxis as measured by the mean (±SE) time spent (seconds) at periphery.C, Object exploratory activity as measured by the mean (±SE) time spent (seconds) at the object area. *Statistically significant (wild type vs 5-HT1B KO; p < 0.05). Locomotor activity. The time course of locomotor activity during the entire experiment (sessions 1–7) is shown in Figure 2A. The ANOVA revealed no significant effect of genotype, but a significant effect of session (F(6,186) = 32.52;p < 0.0001), and no effect of the interaction genotype × session. Habituation of locomotor activity was further assessed by a significant effect of session in both groups (WT,F(6,102) = 16.03, p < 0.0001; 5-HT1B KO, F(6,84) = 17.78,p < 0.0001). Time course of locomotor activity and thigmotaxis in the open field of wild-type and 5-HT1B KO mice during each successive 6 min session (S1–S7) of the object exploration paradigm. A, Locomotor activity as measured by the mean (±SE) distance run (centimeters) in fast movements.B, Thigmotaxis as measured by the mean (±SE) time spent (seconds) at periphery. Thigmotaxic behavior. WT and 5-HT1B KO mice differed significantly in thigmotaxis as revealed by the relative time spent at periphery across sessions (Fig. 2B). The statistical analysis revealed significant genotype (F(1,31) = 6.91; p < 0.02) and session (F(6,186) = 12.19;p < 0.0001) effects, but no significant effect of the interaction genotype × session. It is interesting to note that during session 1 (without object), wild-type mice and 5-HT1B KO mice did not differ significantly in thigmotaxis when the whole session is considered. Object-oriented exploratory activity. The histograms of Figure 3A show the average mean exploratory activity in the areas containing objects and in the area containing no object during session 2. WT and 5-HT1B KO mice preferentially displayed a higher level of exploratory activity in the vicinity of the objects than in the empty area. However, the ANOVA revealed no significant effect of genotype, a significant effect of area (F(1,31) = 97.34; p < 0.0001), but no significant genotype × area interaction. The exploratory activity across sessions 2–7 (Fig. 3B) was observed to be higher in 5-HT1B KO than in WT mice, as revealed by the ANOVA, with a significant effect of genotype (F(1,31) = 3.97; p = 0.05). A significant effect of session (F(5,155) = 3.67; p < 0.005) but a lack of significant effect of the interaction genotype × session were observed. Object-oriented exploratory activity of wild-type and 5-HT1B KO mice. A, Exploratory activity during session 2. The histograms represent the mean (±SE) distance run (centimeters) in slow movements in the areas occupied by objects (OBJECT AREA) as compared with the same measure recorded in a reference area (EMPTY AREA). B, Time course of exploratory activity across sessions (S2–S7), as measured by the mean (±SE) distance run (centimeters) in slow movements at object areas. Habituation of object exploration is shown during sessions 2, 3, and 4 (S2–S4) (B). Habituation of object exploration. The level of exploratory activity progressively decreased from sessions 2 to 4 (sessions without change) (Fig. 3B, S2, S3,S4). The ANOVA revealed a significant session effect (F(2,62) = 4.73; p < 0.02). However, a significant effect of genotype (F(1,31) = 4.64; p < 0.05) was observed that can be accounted for by the maintenance in 5-HT1B KO mice of a higher level of exploratory activity, as compared with WT mice. A further within-subject analysis revealed a session effect in WT mice (F(2,34) = 11.02; p < 0.0005) but not in 5-HT1B KO mice. Thus, only WT mice displayed habituation to object exploratory activity. Response to spatial change. The displaced object, as well as the nondisplaced object, did not change the average level of exploratory activity in either WT or 5-HT1B KO mice. The ANOVA showed no significant effects of genotype, category of object (displaced vs nondisplaced), and session, or of the various interactions (as for object × genotype, session × genotype, object × session × genotype). However, this test was characterized by a high level of variability in individual subject’s reactions in both groups. Ten of 18 WT and 9 of 15 5-HT1B KO mice displayed a selective renewal of exploration toward the displaced object between sessions 4 and 5, but the other mice displayed a lack of systematic reaction or a decreased exploratory activity. Response to the new object. The substitution of a new object for a familiar object (session 7) did not change the exploratory activity toward this novel object between sessions 6 and 7. The ANOVA revealed no significant effects of genotype, category of object, i.e., new versus unchanged, and session. When considering the behavior during session 7 only, the analysis revealed a significant effect of the category of object (F(1,31) = 6.17;p < 0.02), but no effect of genotype or of the interaction object × genotype. Mice of both genotypes explored the new object more than the familiar object during session 7. This tendency, which was not significant in WT mice, approached significance in 5-HT1B KO mice (F(1,31) = 4.01;p = 0.06). The same analysis performed for session 6 revealed no significant effect of the category of object, nor of genotype or of the interaction object × genotype. Visually guided orientation. Both WT and 5-HT1B KO mice quickly learned to reach the platform in a relatively efficient manner. The ANOVA conducted on the escape latencies revealed no effect of genotype, a significant effect of trial (F(3,66) = 10.62; p < 0.0001), and no effect of the interaction genotype × trial, indicating that 5-HT1B KO mice acquired the cued version of the water maze task in a manner similar to that of the WT mice (Table 1). Spatial reference memory learning. Acquisition stage (days 2–10). During the first stage of learning, both groups of mice improved their performance as indicated by the decreasing escape latencies across successive days (day effect:F(8,176) = 20.70; p < 0.0001). However, the escape latency was generally higher in WT than in 5-HT1B KO mice. A significant effect of genotype (F(1,22) = 8.27; p < 0.01) revealed a difference in performance between the two groups, with 5-HT1B KO mice showing better performances. The ANOVA failed to reveal any significant effect of the interaction genotype × day. Note that mice of both genotypes started at the same level of performance (no significant genotype effect was observed for the first three trials of day 2). Transfer stage (days 11–14). The displacement of the platform induced an increase in the mean escape latency (day 11, first day of transfer) of the same extent in both groups; however, 5-HT1B KO mice started at a lower level. Both groups of mice acquired the new goal location (day effect: F(3,66) = 20.07;p < 0.0001); however, a significant effect of the genotype (F(1,22) = 11.02;p < 0.005) suggests that again 5-HT1B KO mice were facilitated. No significant genotype × day interaction was observed. Again, it was found that during the first two trials of day 11, mice did not differ in performance according to their genotype. Long-term retention (day 35). After an interruption of 3 weeks, both groups of mice were able to remember the platform location. The ANOVA failed to reveal any significant genotype effect (latency, mean ± SE = 23.25 ± 2.6 sec for WT and = 21.15 ± 3.27 sec for 5-HT1B KO mice). Acquisition stage: escape latencies to the platform.Figure 4A shows the learning curves from day 1 to day 10 (D1–D10). 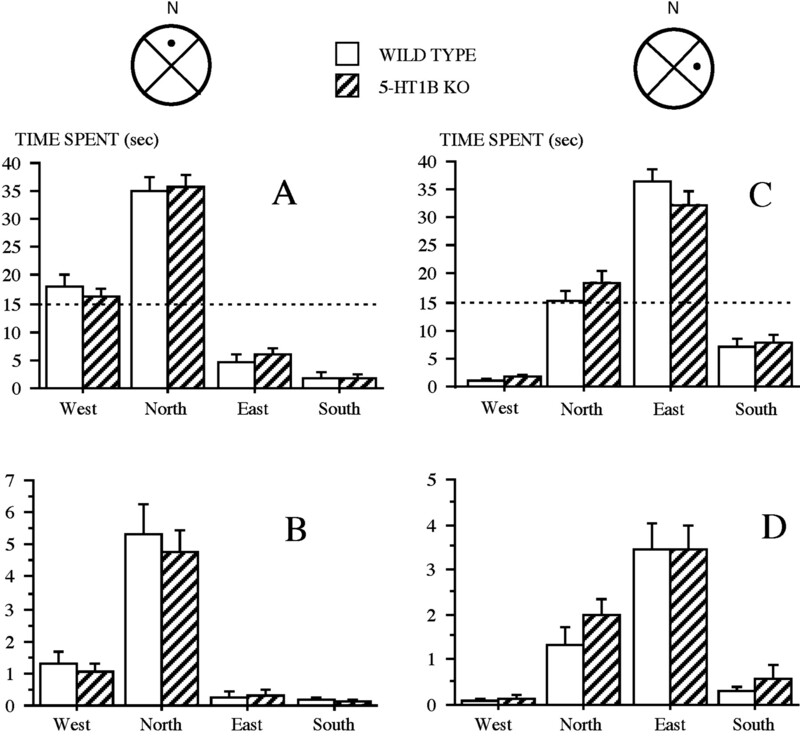 Both WT and 5-HT1B KO mice learned the task and exhibited decreasing escape latency across days. The ANOVA revealed significant effects of day (F(9,198) = 34.78; p < 0.0001) and genotype (F(1,22) = 20.72;p < 0.0005) and a nonsignificant effect of the interaction genotype × day. These results suggest that both WT and 5-HT1B KO mice were able to learn the task, but a difference in performance was found between groups, with 5-HT1B KO mice reaching the platform faster. Water maze: Experiment II. Performance across days (D1–D14) during the acquisition stage (D1–D10) and the transfer stage (D11–D14) of wild-type and 5-HT1B KO mice.A, Mean (±SE) latency (seconds) to reach the platform.B, Mean (±SE) path length (centimeters).C, Mean (±SE) velocity (centimeters per second). Path length. The distance covered by the mice to reach the platform decreased across days (days 1–10) in both WT and 5-HT1B KO groups (Fig. 4B). The ANOVA revealed a significant effect of day (F(9,198) = 45.84;p < 0.0001). Path lengths of 5-HT1B KO mice were shorter than those of WT mice. The ANOVA revealed a significant effect of genotype (F(1,22) = 14.88;p < 0.001) but no significant interaction genotype × day. Velocity. Swimming speed evolved differently across days depending on the genotype (genotype effect:F(1,22) = 9.37, p < 0.01; day effect: F(9,198) = 31.78,p < 0.0001; interaction genotype × day,F(9,198) = 2.62, p < 0.01). Both groups displayed the same swimming speed from day 1 to day 6. 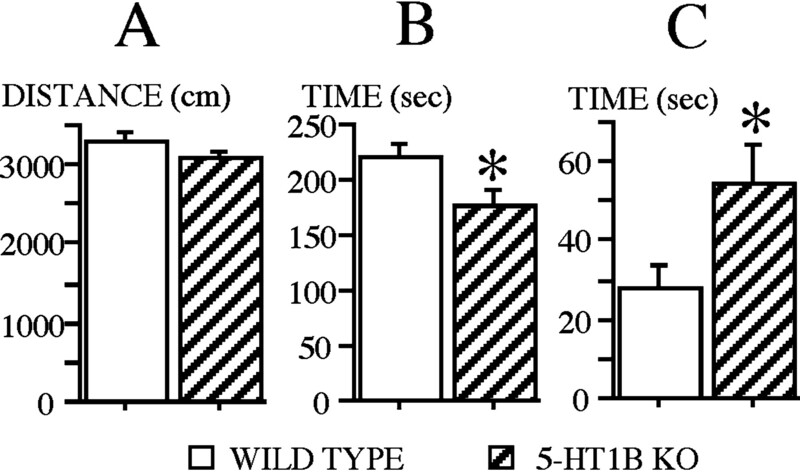 Then (days 7–10), although 5-HT1B KO mice kept on a constant speed (14.5 cm/sec), WT mice decreased their velocity (from an average of 14 cm/sec to 11 cm/sec) at the end of this learning period (Fig.4C). This change in velocity corresponds to the time the WT mice improved their performances until reaching the asymptotic level of performance previously reached by the 5-HT1B KO mice (day 3). Probe trial on day 10. The withdrawal of the platform induced a general tendency to swim, preferentially to other equivalent zones, in the quadrant where the platform was previously located (QUADRANT) (Fig. 5A) and in the platform zone (PLATFORM) (Fig. 5B). In terms of relative time spent in the four equivalent zones, the ANOVA revealed this preference displayed by both genotypes (QUADRANT, no significant genotype effect; significant zone effect,F(3,66) = 133.92, p < 0.0001; PLATFORM, no significant genotype effect; zone effect,F(3,66) = 46.00, p < 0.0001). Furthermore, the analysis conducted on the crossings onto PLATFORM again revealed a marked preference in both genotypes (no significant genotype effect; significant zone effect,F(3,66) = 54.99, p < 0.0001). Thus at the end of the acquisition period, WT were similar to 5-HT1B KO mice in their ability to remember accurately the location of the platform. Water maze: Experiment II. Probe trials on days 10 (A, B) and 14 (C, D). Mean (±SE) time spent (seconds) in the different quadrants (A, C), and in PLATFORM (B, D) is shown. The schemas (top) represent the pool (n =North), with the platform location (black dot). The dashed horizontal line indicates the random level. Transfer stage. Both WT and 5-HT1B KO mice relearned the new position of the platform, from day 11 to day 14, improving their performance across days (Fig. 4). The ANOVA thus revealed a significant day effect for both escape latencies (F(3,66) = 33.94; p < 0.0001) and path length (F(3,66) = 35.09;p < 0.0001). 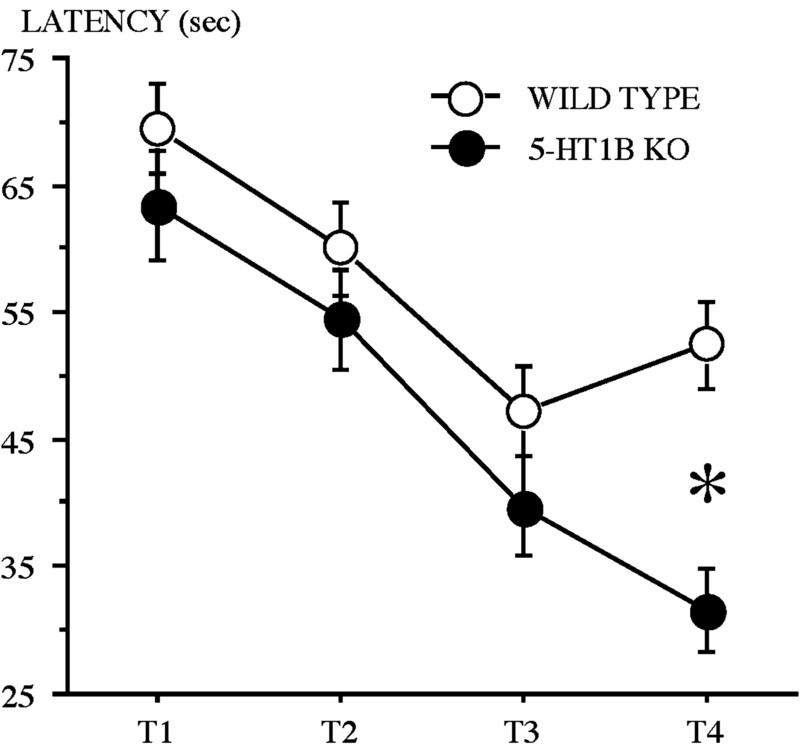 5-HT1B KO mice again displayed higher performances [reduced latency and path length as compared with WT (Fig. 4, A and B, respectively)]. Significant genotype effects were revealed for both the latency (F(1,22) = 21.76; p = 0.0001) and path length (F(1,22) = 9.57;p < 0.01) but no significant effects of the interaction genotype × day. On day 13, WT mice reached the 5-HT1B KO mice performance level, as evaluated in terms of path length. Swimming speed (Fig. 4C) differed between genotypes across days (genotype effect: F(1,22) = 19.17,p < 0.0005; day effect:F(3,66) = 12.38, p < 0.0001), with a sensitive decrease in WT (from 14 to 11 cm/sec, on average) and a less marked decrease in 5-HT1B KO mice (mean speed 16–15 cm/sec), respectively (interaction genotype × day:F(3,66) = 4.21; p < 0.01). Probe trial on day 14. Both WT and 5-HT1B KO mice preferentially swam in zones defining the recent location of the platform as opposed to other equivalent zones: QUADRANT (Fig.5C), PLATFORM (Fig. 5D). This preference was displayed similarly by both genotypes (QUADRANT, no significant genotype effect; significant zone effect,F(3,66) = 121.96; p < 0.0001; no significant genotype × zone interaction; PLATFORM, no significant genotype effect; significant zone effect,F(3,66) = 29.50; p < 0.0001; no significant genotype × zone interaction). A marked preference for swimming onto the platform was further assessed by the analysis of crossings (PLATFORM, genotype effect,F(1,22) = 5.80; p = 0.025; zone effect, F(3,66) = 50.67;p < 0.0001; no significant genotype × zone interaction). Thus at the end of the transfer, WT did not differ from 5-HT1B KO mice in their accurate remembering of the location of the platform. However, the marginal effect of the genotype observed in this analysis was found to be caused by a higher activity of 5-HT1B KO. Spatial working memory learning. Mice from both genotypes, subjected to four daily trials with the changing of platform location from day to day, improved their performances (latency) from trial 1 to trial 4 of each day (Fig. 6). The ANOVA performed on the escape latency revealed a significant effect of trial (F(3,66) = 40.19; p = 0.0001). 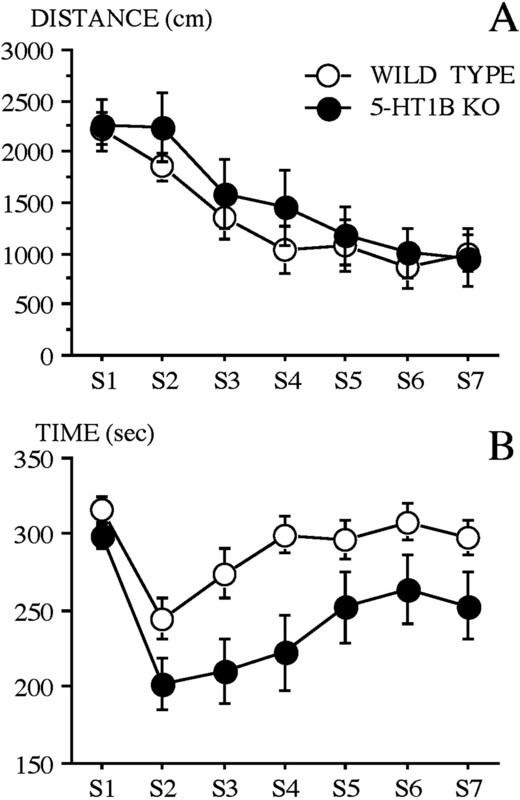 5-HT1B KO mice displayed a sharper learning curve [from a mean (±SE) = 63.40 ± 4.4 sec (trial 1) to 31.5 ± 3.2 sec (trial 4)], as compared with WT mice [from 69.40 ± 3.6 sec (trial 1) to 52.4 ± 3.3 sec (trial 4)]. A significant effect of genotype (F(1,22) = 5.91; p< 0.05) and of the interaction genotype × trial (F(3,66) = 3.78; p < 0.02) suggests that this improvement was higher in 5-HT1B KO mice than in WT. The analysis did not reveal any significant effect of day and of the interaction genotype × day, which suggests that the improvement was independent from one day to another. However, when path length was considered, the ANOVA revealed no significant effect of genotype, but did reveal significant effects of trial (F(3,66) = 28.56; p = 0.0001) and of the interaction genotype × trial (F(3,66) = 5.1; p < 0.005). Spatial working memory performance of wild-type and 5-HT1B KO mice. Shown are performances across trials (T1–T4) as measured by the mean (±SE) latency (seconds) to reach the platform. *Statistically significant (p = 0.0002). The exploratory activities displayed by WT and 5-HT1B KO mice in the Y-maze did not show any preference bias in the frequency of visits to the different arms; however, 5-HT1B KO mice displayed higher levels of locomotor activity than WT mice. The ANOVA conducted on the number of entries in the arms thus revealed a lack of significant effect of the arm but a significant effect of the genotype (F(1,22) = 15.28; p < 0.001) and a nonsignificant genotype × arm interaction. Spontaneous alternation was equally displayed by mice of both genotypes. The ANOVA revealed a lack of significant genotype effect for both simple and second order alternations. Simple alternations represented 96% of the pattern of WT mice and 97% of those of 5-HT1B KO mice. Mice did not display strong side preferences. The ANOVA revealed no significant effects of genotype but a significant effect of the interaction genotype × side (F(1,22) = 11.02; p < 0.005), which reveals a weak but opposite side preference between WT (60% right) and 5-HT1B KO mice (57% left). The ANOVA conducted on the number of entries in the open and closed arms did not reveal any significant effect of genotype. This result suggests that locomotor/exploratory activity was identical in both groups of mice in this apparatus. The ANOVA conducted on the index of anxiety did not reveal any significant effect of genotype. Thus anxiety levels were found to be similar in WT and 5-HT1B KO mice as assessed in the elevated plus maze. Time spent freezing increased across blocks during training (first session) in both WT and 5-HT1B KO mice, with a minimum during the first 2 min block, i.e., before the onset of the tone + shock (mean ± SE = 8.46 ± 1.5 sec for WT, and = 6.6 ± 0.9 sec for 5-HT1B KO mice). After the first (second block) and then the second (third block) presentation of the tone + shock pairing, freezing gradually reached elevated values as shown in Figure7A. The ANOVA revealed a significant effect of block (F(2,24) = 79.14; p < 0.0001) but no significant effects of genotype or of the interaction genotype × block. Contextual fear conditioning in wild-type and 5-HT1B KO mice. Shown are mean (±SE) duration (seconds) of freezing on successive 2 min blocks (0–2, 2–4, 4–6) during training (A), at reexposure to the context (B), and in response to the auditory cue in a new context (C). When brought back in the previous context 24 hr after training (second session), mice exhibited high levels of freezing, which increased from block 1 to block 2, suggesting that they remembered the context where they received the electric shock the day before (Fig.7B). The ANOVA revealed a significant effect of block (F(2,24) = 3.86; p < 0.05) but no significant effect of genotype or of the interaction genotype × block. Both groups of mice froze in a similar manner, beginning during the first 0–2 min block, when they were placed back in the conditioning chamber. When placed in a new context (third session), mice displayed an increase in freezing at the onset of the tone (second block) (Fig.7C). The ANOVA revealed a significant effect of block (F(2,24) = 20.98; p < 0.0001), but no significant effect of genotype or of the interaction genotype × block. In the new context, WT and 5-HT1B KO mice froze equally at the presentation of the tone, which had been associated previously with the electric shock. The entire experiment did not enable us to detect any differences between WT and 5-HT1B KO mice in the emotional response induced by fear conditioning. Only a marginally significant effect of the genotype was observed when comparing freezing responses limited to the first block (0–2 min) of the successive three sessions of the experiment (training, old context, new context) (F(1,12) = 4.22; p = 0.06), associated with a significant session effect (F(2,24) = 40.94; p < 0.0001), but no significant genotype × session interaction. Further punctual analyses indicate that this slight difference in genotype might be limited only to the auditory cue test (third session), during which WT mice displayed a tendency to freeze more than 5-HT1B KO mice (F(1,12) = 4.10;p = 0.06), but nonsignificant genotype differences were observed during both training and context sessions. Locomotor activity as assessed in activity cages decreased regularly over time (5 min blocks/60 min test) in both WT and 5-HT1B KO mice (Fig. 8A). The ANOVA revealed no significant effect of genotype, a significant effect of block (F(11,242) = 23.37;p < 0.0001), and no significant effect of the interaction genotype × block. Moreover, the effect of a systemic treatment by the RU 24969 on locomotor activity selectively affected WT but not 5-HT1B KO mice (Fig. 8B). After injection, WT mice displayed a dramatic and progressive increase in activity that persisted for at least 2 hr, whereas 5-HT1B KO mice did not show any change from their previous asymptotic level of activity. The ANOVA conducted on the raw data (30 min blocks/180 min test) revealed significant effects of genotype (F(1,22) = 5.69; p < 0.05), of block (F(5,110) = 4.42; p = 0.001), and of the interaction genotype × block (F(5,110) = 9.42; p < 0.0001). Locomotor activity in wild-type and 5-HT1B KO mice. A, Mean (±SE) activity units on successive 5 min blocks across the 60 min test period. B, Mean (±SE) activity units on successive 30 min blocks across the 180 min test period. The arrow indicates the time of injection by RU 24969 (5 mg/kg, i.p.). The anatomical localization of 5-HT1B/1D binding sites is shown in Figure 9 on brain sections of WT and 5-HT1B KO mice. With 0.3 nmS-CM-G[125I]TNH2 alone, a high density of labeling is observed in the WT (Fig. 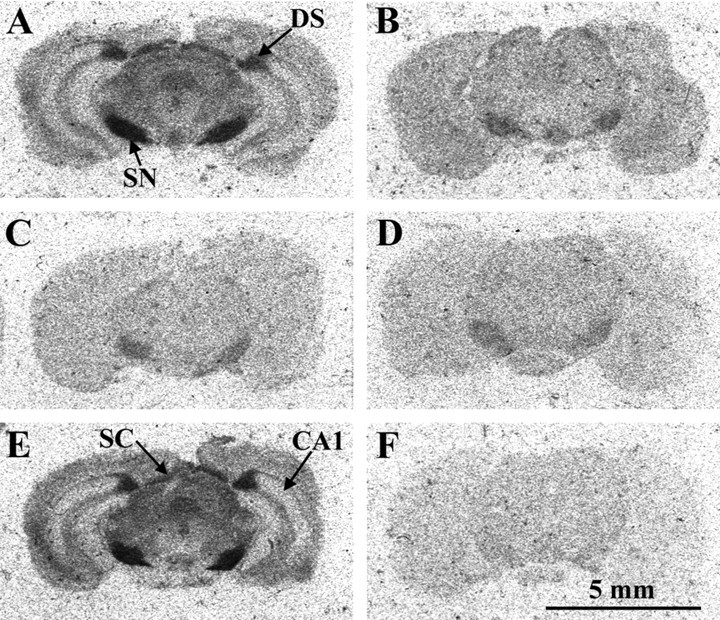 9A), especially in the substantia nigra, the dorsal subiculum, and the superior colliculus, whereas a low density is observed in the substantia nigra of the 5-HT1B KO mouse (Fig. 9B), which corresponds to 18% of the labeling of the same structure in WT [WT = 0.630 nCi/mg, 5-HT1B KO = 0.115 nCi/mg, (F(1,20) = 222.74;p < 0.001)]. The level of 5-HT1D sites was assessed by addition of 10−6m CP 93129 to the incubation medium, which selectively masks 5-HT1B sites. The density of 5-HT1D sites does not differ between genotypes (Fig. 9C,D), whatever the anatomical structure considered: substantia nigra (WT = 0.096 nCi/mg, 5-HT1B KO = 0.087 nCi/mg); globus pallidus (WT = 0.089 nCi/mg, 5-HT1B KO = 0.086 nCi/mg); striatum (WT = 0.067 nCi/mg, 5-HT1B KO = 0.069 nCi/mg). The addition of 10−5m 8-OH-DPAT to the incubation medium did not change the level of labeling in the WT (Fig.9E) caused by the presence of 5-HT1B sites, but resulted in the disappearance of the labeling in the 5-HT1B KO mice (Fig.9F). Treatment with 10−7m 8-OH-DPAT does not modify the labeling in either genotype (data not shown). There was no significant effect of the genotype on the density of 5-HT1A binding sites and no significant effect of the interaction genotype × anatomical structure, but a significant effect of the anatomical structure (F(1,6)= 15.10; p < 0.001), with the highest labeling in the radiatum layer of CA1 (WT = 13.47 nCi/mg, 5-HT1B KO = 12.86 nCi/mg) and the lowest density in the outer layer of parietal cortex (WT = 3.36nCi/mg, 5-HT1B KO = 3.15 nCi/mg). Receptor autoradiography on brain sections of wild-type (A, C, E) and 5-HT1B KO (B, D, F) 129/Sv mice. 5-HT1B/1D binding sites: 10-μm-thick brain sections were incubated with 0.3 nmS-CM-G[125I]TNH2 alone (A, B).C, D, 5-HT1D binding sites as revealed in presence of 10−6m CP 93129 (masking 5-HT1B binding sites). E, F, 5-HT1B binding sites as revealed in the presence of 10−5m 8-OH-DPAT (masking 5-HT1D binding sites). The nonspecific binding results in the same level of labeling as given in F. CA1, Subfield 1 of Ammon’s horn; DS, dorsal subiculum;SC, superior colliculus; SN, substantia nigra. The main finding of this study is that the deletion of a single gene coding for a particular 5-HT receptor, the 5-HT1B, is associated with facilitation of learning abilities, without affecting general emotional state or locomotor abilities. WT and 5-HT1B KO mice differed in locomotor/exploratory activity only when the environment was relatively “rich” given its internal structure (Y-maze) or the addition of inner variety (objects in the open field). The activity cages and the elevated plus maze did not reveal any locomotor differences as a function of genotype. The lack of genotype differences in freezing during the first 2 min of the training session of fear conditioning suggests a lack of change in the basic activity level recorded in this “poor” environment. It may also be possible that this environment-dependent genotype difference in exploration may be attributable to the sequence of testing the mice, which started as naive in the stressful water maze task and were subsequently submitted to free-exploration tests (Y-maze, elevated plus maze). However, we replicated these tests with naive animals and obtained quite similar results (M.-C. Buhot, unpublished observation). From the object exploration task performed by naive mice we observed that 5-HT1B KO mice displayed no differences in locomotor activity as compared with WT mice, a result consistent with our previous observations (Saudou et al., 1994), but the present study also showed that WT and 5-HT1B KO mice did not differ in exploratory strategy (spontaneous alternation), i.e., if we consider more qualitative aspects of exploratory behavior. In a previous study, we observed that the 5-HT1B agonist CP-93129 injected into the dorsal hippocampus decreased locomotor activity in the open field immediately after the first contact of the rat with the new environment and induced neophobic reaction in the presence of a new object replacing a familiar one (Buhot and Naı̈li, 1995). This finding is relevant to the possible anxiogenic action of 5-HT1B receptor agonists, and to the role played by the hippocampus in emotional states (Gray, 1984; LeDoux, 1993). In the open field containing one object or several objects, 5-HT1B KO mice displayed elevated exploratory activity associated with a decrease in thigmotaxis without elevation of locomotor activity. However, it was observed that in the absence of objects (session 1 of the multiple-session exploration study), WT and 5-HT1B KO mice did not differ significantly in thigmotaxis. It is thus not certain that thigmotaxis in the presence of objects directly reveals a higher level of anxiety. Furthermore, we confirmed that 5-HT1B KO mice do not differ from WT in anxiety measured, in the present study, in the elevated plus maze, as observed previously using another model of anxiety, i.e., the light/dark choice test (Ramboz et al., 1996). This dissociation between locomotor and more cognitive components of the mouse’s behavior suggests that “shyness,” a characteristic of 129/Sv mice, is reduced in 5-HT1B KO mice, which respond more positively to novelty. The higher and sustained level of exploratory activity found in 5-HT1B KO mice could reveal a lack of behavioral inhibition, which may indicate the presence of some aspect of impulsive behavior. However, if the 5-HT1B KO mice display impulsive behavior in a social context (aggression toward male intruders) (Saudou et al., 1994), they do not clearly exhibit impulsive reactions in food-reinforced instrumental learning (Brunner and Hen, 1997), but they develop a higher tendency toward alcohol consumption than WT (Crabbe et al., 1996) and are more motivated to self-administer cocaine (Rocha et al., 1998). The high level of reactivity to the environment displayed by the 5-HT1B KO mice suggests a pattern of behavior similar to the syndrome of “overattention” found in schizophrenia, a disorder possibly linked to serotonin dysfunction, with 5-HT1A and 1B receptors involved as possible major mediating targets (Gray et al., 1991; Cassaday et al., 1993). However, 5-HT1B KO mice display an increased pattern of prepulse inhibition, which may reveal elevated attentional capacities, at least at the sensorimotor level (Dulawa et al., 1997). This attentional component cannot be neglected in the analysis of learning and memory abilities of 5-HT1B KO mice. The lack of exploratory habituation found in 5-HT1B KO mice might reveal a type of memory impairment that is frequently revealed as a consequence of hippocampal dysfunctioning but cannot by itself explain the lack of reaction to a spatial change (Thinus-Blanc et al., 1991;Save et al., 1992b). Neither WT nor 5-HT1B KO mice reacted to spatial change, which might be attributable to their reputation as poor cognitive subjects (Gerlai, 1996). The water maze task was thus expected to critically elucidate major points regarding direct learning and memory abilities of the 5-HT1B KO mice. A first experiment using a spatial reference memory procedure showed that 5-HT1B KO mice acquired the task faster than WT mice. However, this difference in performance was selectively related to spatial memory, because WT and 5-HT1B KO mice did not differ in the cue version of the task. The second experiment highlighted the fact that the better performance of the 5-HT1B KO mice was not simply attributable to a higher swimming speed. Shorter path lengths in 5-HT1B KO mice clearly assessed better orientation accuracy in comparison with WT mice, especially during acquisition. WT mice, however, improved their performance over time and at the same time decreased their velocity. This behavior, interestingly, might reflect a form of hesitation [vicarious trial and error (Tolman, 1939)], which corresponds to a “mental” reorganization found to be associated with the achievement of learning (Teule et al., 1972; Amsel, 1993). During the transfer stage, 5-HT1B KO mice again appeared to be facilitated: they relearned the new location of the platform faster than WT, which may be interpreted as better cognitive flexibility. This flexibility requires that the animal does not perseverate in choosing a wrong solution (i.e., the one that was previously correct but is no longer appropriate) and thus reorganizes its behavior to solve the new spatial problem. The underlying mechanisms allowing such adaptive behavior belong to a behavioral inhibition system, the functions of which are shared, in particular, by the serotonin system and the hippocampal formation (Gray, 1984). This is a second argument showing that mice, which display impulsivity in a social context, are nevertheless able to develop normal (even facilitated) behavioral inhibition in a cognitive context. The probe trials assessed the achievement of learning in mice of both genotypes through their accuracy in searching the previous location of the platform. In the working/short-term memory version of the water maze task, 5-HT1B KO and WT mice improved their performance across trials, which suggests that they do not differ in their short-term memory capacities. Spontaneous alternation was also equally displayed by mice of both genotypes, thus revealing identical and efficient working memory abilities. The performances in contextual fear conditioning did not reveal any difference between 5-HT1B KO and WT mice, which is surprising because this task is considered to be hippocampal dependent, as is the water maze task. However, the cognitive demand of each of these tasks can be considered to be different. The 5-HT1B KO mice displayed better performance than WT mice on the more cognitively demanding task (water maze), but no differences between genotypes were observed on the less demanding (contextual fear conditioning) task, as is also the case for other systems involved in hippocampal-dependent memory (Bach et al., 1995). It thus becomes possible that the 5-HT1B receptor plays a particular role in behaviors that involve a high cognitive demand (Buhot, 1997). The inactivation of 5-HT1B receptors might facilitate learning (Meneses et al., 1997), and 5-HT1B antagonists might reveal antiamnesic properties (Buhot, 1997). This may be the result of various neurobiological mechanisms taking place in particular cerebral structures involved in learning and memory. The blockade of 5-HT1B receptors located on medial septal cholinergic terminals might facilitate cholinergic transmission to the hippocampus, and thus the acquisition stage of spatial learning. In the same way, the blockade of 5-HT1B receptors located on glutamatergic CA1–subiculum terminals might facilitate the transfer of processed information from the hippocampus to cortical areas and thus might participate in memory storage mechanisms (Aı̈t Amara et al., 1995). To summarize, the absence of 5-HT1B receptors does not result in the occurrence or absence of a particular behavior but in the level of its expression. This is true for “spontaneous” behavior, inasmuch as the environment solicits sustained exploration, but also for those behaviors involved in memory and complex associative learning. The deletion of the 5-HT1B receptor, associated with appropriate behavioral paradigms, allows the dissociation of anxiety from response to novelty, and perseverative behaviors [drug addiction (Rocha et al., 1998), social aggression (Saudou et al., 1994), lack of habituation] from adaptive behavioral inhibition underlying learning mechanisms that facilitate cognitive flexibility. Autoradiographic analyses showed that brains of 5-HT1B KO mice, as expected, do not express 5-HT1B binding sites. The level of 5-HT1D sites is unchanged in the 5-HT1B KO (18% of 5-HT1B+1D sites), showing no apparent plasticity of this receptor type, which is genetically, pharmacologically, and anatomically well related to the 5-HT1B receptor. The 5-HT1A receptor is the more abundant of the 5-HT receptors in the hippocampus, and its distribution in all layers of this structure suggests possible plasticity of this site in the absence of 5-HT1B receptors. Our analyses showed no difference in 5-HT1A binding site density between WT and 5-HT1B KO mice. This does not preclude a modification of the sensitivity of the receptor. Other candidates to adapt the behavior to the absence of the 5-HT1B would be the receptors of the neurotransmitters present in the circuitry where the receptor protein of the deleted gene is normally present, i.e., glutamate in the CA1–dorsal subiculum and acetylcholine in the septohippocampal pathway, as is the case for some dopamine receptors in the nigrostriatal loop (Rocha et al., 1998). To avoid these possible developmental plasticities, recent targeting techniques allow the production of inducible mice for which the expression of a specific gene can be regulated in time (starting in adulthood, for example) and space (anatomically) (Stark et al., 1998). Under these new conditions, it will soon become possible to more directly “target” the different functions of the 5-HT1B receptor. This research was supported by the Centre National de la Recherche Scientifique, Université de Bordeaux 1, and partly by the European Commission (Biotechnology Program, Bio2CT-CT93-0179) and a NATO grant (CRG940753). We thank Dr. T. P. Durkin for linguistic corrections of this manuscript and helpful discussions, M. Chaigniau for illustrations, the Laboratory of Transgenose (Pr. J.-Y. Daniel, Dr. P. Costet) and D. Panzeri for their help in animal breeding and care, T. Lafon, C. Maubaret, G. Creste, and L. Gautron for their technical assistance in behavioral experiments, and Dr. J. Chauveau (Immunotech, Marseille, France) for the generous gift of S-CM-G[125I]TNH2. Correspondence should be addressed to Dr. M.-C. Buhot, Laboratoire de Neurosciences Comportementales et Cognitives, Centre National de la Recherche Scientifique, Unité Mixte de Recherche 5807, Avenue des Facultés, 33405 Talence cedex, France. (1995) Serotonin 1B receptor regulation after dorsal subiculum deafferentation. Brain Res Bull 38:17–23. (1993) Hippocampal function in the rat: mapping or vicarious trial and error? Hippocampus 3:251–256. (1997) The effect of nonspatial water maze pretraining in rats subjected to serotonin depletion and muscarinic receptor antagonism: a detailed behavioural assessment of spatial performance. Behav Brain Res 88:201–211. (1996) Activation of 5-HT1B receptors suppresses low but not high frequency synaptic transmission in the rat subicular cortex in vitro. Brain Res 721:59–65. (1994) The mouse 5-hydroxytryptamine 1B receptor is localized predominantly on axon terminals. Neuroscience 58:167–182. (1993) Effects of retinal deafferentation on serotonin receptor types in the superficial grey layer of the superior colliculus of the rat. J Chem Neuroanat 6:167–175. (1995) Distractibility and locomotor activity in rat following intra-collicular injection of a serotonin 1B–1D agonist. Behav Brain Res 67:229–239. (1996) Subcellular localization of the 5-HT1B binding sites in the stratum griseum superficiale of the rat superior colliculus. An electron microscopic quantitative autoradiographic study. Synapse 24:203–212. (1983) Memory and the septo-hippocampal cholinergic system in the rat. Psychopharmacology 81:315–320. (1997) Insights into the neurobiology of impulsive behavior from serotonin receptor knock out mice. Ann NY Acad Sci 836:81–105. (1997) Serotonin receptors in cognitive behaviors. Curr Opin Neurobiol 7:243–254. (1995) Changes in exploratory activity following stimulation of hippocampal 5-HT1A and 5-HT1B receptors in the rat. Hippocampus 5:198–208. (1991) Spatial problem solving in a wheel-shaped maze: quantitative and qualitative analyses of the behavioural changes following damage to the hippocampus in the rat. Behav Brain Res 44:67–79. (1995) Spatial memory deficits following stimulation of hippocampal 5-HT1B receptors in the rat. Eur J Pharmacol 285:221–228. (1993) The effect of ritanserin, RU 24 969 and 8-OH-DPAT on latent inhibition in the rat. J Psychopharmacol 7:63–71. (1987) Animal models of anxiety: the effect of compounds that modify 5-HT neurotransmission. Trends Pharmacol Sci 8:383–388. (1996) Elevated alcohol consumption in null mutant mice lacking 5-HT1B serotonin receptors. Nat Genet 14:98–101. (1997) Serotonin 1B receptor modulation of startle reactivity, habituation, and prepulse inhibition in wild-type and serotonin 1B knockout mice. Psychopharmacology 132:125–134. (1997) Contextual conditioned fear blocks the induction but not the maintenance of lateral septal LTP in behaving mice. J Neurophysiol 78:76–81. (1984) The hippocampus as an interface between cognition and emotion. in Animal cognition, Vol 3, eds Roitblat HL, Bever TG, Terrace HS (LEA, Hillsdale, NJ), pp 607–625. (1991) The neuropsychology of schizophrenia. Behav Brain Sci 14:1–84. (1996) Classification and nomenclature of 5-HT receptors: a comment on current issues. Behav Brain Res 73:263–268. (1993) On the role of the hippocampus in learning and memory in the rat. Behav Neurol Biol 60:9–26. (1993) Medial septal lesions disrupt spatial, but not nonspatial, working memory in rats. Behav Neurosci 107:565–574. (1993) Emotional memory systems in the brain. Behav Brain Res 58:69–79. (1997) CP-94, 253: a selective serotonin1B (5-HT1B) agonist that promotes satiety. Psychopharmacology 131:264–270. (1990) 3-(1,2,5,6-Tetrahydropyrid-4-yl)pyrrolo[3,2-b]pyrid-5-one: a potent and selective serotonin (5-HT1B) agonist and rotationally restricted phenolic analogue of 5-methoxy-3-(1,2,5,6-tetrahydropyrid-4-yl)indole. J Med Chem 33:2087–2093. (1986) Cholinergic terminals in rat hippocampus possess 5-HT1B receptors mediating inhibition of acetylcholine release. Eur J Pharmacol 129:333–337. (1997) Effects of the 5-HT receptor antagonists GR127935 (5-HT1B/1D) and MDL 100907 (5-HT2A) in the consolidation of learning. Behav Brain Res 89:217–223. (1984) Development of a water-maze procedure for studying spatial learning in the rat. J Neurosci Methods 11:47–60. (1987) Tolerance to the serotonin 5-HT1 agonist RU24969 and effects on dopaminergic behavior. Eur J Pharmacol 205:139–205. (1978) The hippocampus as a cognitive map. (Clarendon, Oxford). (1996) 5-HT1B receptor knock out: behavioral consequences. Behav Brain Res 73:305–312. (1998) Increased vulnerability to cocaine in mice lacking the serotonin-1B receptor. Nature 393:175–178. (1994) Enhanced aggressive behavior in mice lacking 5-HT1B receptor. Science 265:1875–1878. (1992a) Exploratory activity and response to a spatial change in rats with hippocampal or posterior parietal cortical lesions. Behav Brain Res 47:113–127. (1992b) Object exploration and reactions to spatial and nonspatial changes in hooded rats following damage to parietal cortex or hippocampal formation. Behav Neurosci 106:447–456. (1990) A new system for computer-assisted quantitative receptor autoradiography. J Neurosci Methods 31:197–205. (1998) Novel strategies to probe the functions of serotonin receptors. Biol Psychiatry 44:163–168. (1972) Apprentissage d’élimination progressive chez le hamster doré. Psychologie Française 17:175–182. (1991) The effects of reversible inactivations of the hippocampus on exploratory activity and spatial memory. Hippocampus 1:365–372. (1939) Prediction of vicarious trial and error by means of the schematic sowbug. Psychol Rev 46:318–336.